The Northeastern part of the United States has already had some major snow accumulation this year, but those storms may pale next to the one that National Weather Service is predicting for the Midwest. Light snow has already begun falling over the region, but that is only the first wave according to predictions. The storm is being called "historic" and comparisons are being made to a major storm in late January, 1967. Some areas of the region are expected to get almost two feet of snow from this system. Municipalities, like Chicago, are preparing for the worst, rolling out emergency snow removal plans and encouraging residents to prepare now for the storm. All but essential travel will be recommended if the storm reaches the expected levels. Airlines and airports are also bracing for what will become a logistical nightmare as air traffic comes to a halt and snow removal crews battle to stay ahead of the storm. The most dangerous aspect of the storm will be the high winds which will accompany the snow, making it virtually impossible to see. Cruise passengers may be impacted by the storm as travel delays and cancellations have a ripple effect across the country. For those traveling, be sure to call ahead to your carrier to see how the storm impacts you. 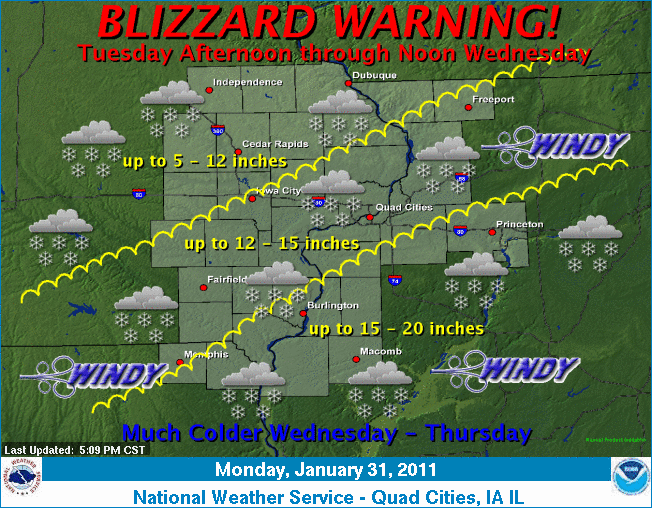 Major weather events like this are perfect commercials for travel insurance. Be sure to read your policy and know what coverage and assistance you can expect from your carrier and insurance company. It might be too late to get ahead of the storm, but that too should be considered. Here are some resources that can come in handy as the storm intensifies. Loyalty has its rewards... You've probably heard that before. This is true for many businesses that you may frequent, including airlines, hotels, and even cruise lines. The Crown & Anchor® Society is Royal Caribbean's way of recognizing and rewarding their most loyal guests. As a member, you’ll receive exclusive benefits and privileges to make your cruise experiences with Royal Caribbean International® even more spectacular. As of January 21, 2011, existing cruise credits were converted into cruise points. Existing members didn't lose their current status and will continue to receive all the existing benefits at their previous tier level. The Emerald Tier was added between Platinum and Diamond and provides some new benefits including higher balcony and suite discounts and a personalized welcome gift/amenity onboard. *Moving forward, achieving Pinnacle Club status will require 700 points. Now for a limited time, you can enjoy an exclusive reward, when bring your friends along to experience their first Royal Caribbean International® cruise vacation. Receive $25 to spend onboard for each stateroom your friends reserve on your cruise. Learn more (click here) Existing members should visit the website for complete details and to update their profiles. MSC Cruises has cancelled all the upcoming calls of MSC Magnifica and MSC Splendida at Alexandria for the rest of the season. They will continue to follow the situation very closely and in case the situation would stabilize again would change the itineraries back to their original deployment. You will find all the latest updates on this page. Political unrest in Egypt has prompted the U.S. State Department to issue a Travel Alert for Egypt effective from now until the end of February. Cruise lines have been monitoring the situation and, in the wake of the alert, have made modifications or cancellations. At this time Uniworld is canceling upcoming tours due to arrive in Egypt up to and including February 12, 2011, and customers may choose alternative tours or a full refund. Clients who plan to travel on our Egypt tours from February 13 through February 28, 2011 have the option to cancel and rebook any 2011 Uniworld program. The full value of the canceled booking will be applied toward the new booking. 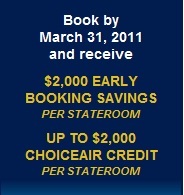 Guests must re-book by March 31, 2011. MSC Splendida and MSC Magnifica were expected to call at Alexandria over the next few days, but they're being diverted. Magnifica will now call at Limassol, Cyprus, and Haifa, Israel, on Sunday and Monday, respectively. Splendida will call at Izmir, Turkey, on Monday. Norwegian Jade was due to overnight in Alexandria on Sunday. It will now call at Istanbul. All tour operators are monitoring the situation and it's safe to assume the majority of land-based excursions in the immediate future will be cancelled. Contact your travel provider directly for updates if your cruise or tour isn't mentioned here. 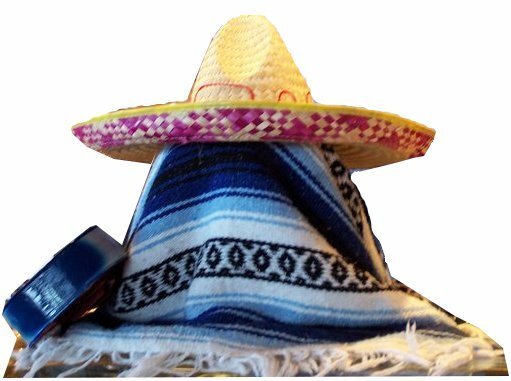 Three cruise lines: Holland America, Princess, and Disney Cruise Line, have announced modifications to their Mexican Riviera cruises in the wake of recent violence against cruise passengers. Update January 31st - Some cruises returning to Mazatlan, but situation is still being monitored. Norwegian Star, Carnival Spirit and Holland America's Oosterdam will call there this week. Disney Wonder's scheduled calls in Mazatlan, now through April, have been replaced with extra time in Cabo San Lucas, Mexico. The ship will not stay overnight, but rather will leave port and then return in the morning for a second day in picturesque Cabo San Lucas. The incidents over the past two weeks involved passengers and crew from the Azamara Journey and Holland America's Oosterdam. News reports indicated a necklace and a laptop were stolen. There wasn't any mention of injury related to the attacks, but cruise lines have taken these steps as a precautionary measure to keep passengers and crew safe. Perhaps this is the final nail in the coffin for the region as cruise lines had already begun pulling out of the Mexican Riviera sighting decreased demand. At a panel discussion, during our National Conference last October, cruise line executives had reported the decreased interest causing them to redeploy ships. West coast agents, as well as those across the country, expressed disapproval but the executives reiterated their decisions had been made, and would that they would not be reassessing the situation in the near future. At the time of this article's publication, there were no updated bulletins specifically addressing violence in Mazatlan, but there has been increasing drug-related violence in the region causing travel companies to keep a close eye on changing conditions. Last November we reported that Royal Caribbean International® had scheduled dry-dock make-overs for five of their 22 ships. When unveiling the the new enhancements to their fleet for 2011, Royal AdvantageSM was announced. The program would expand their most popular innovations to select ships, giving more to see, more to do, and more to love, to more guests than ever before. If you travel much, you are familiar with the term "double occupancy". It has been the pricing standard in the travel industry (including cruises) for as long as I can recall. Hotels and cruise lines provide pricing based on two people occupying a room / cabin. If you are traveling alone, you still pay the price that two people would pay, and in some cases, even more. In the cruise industry, even though pricing is double occupancy, quotes are provided on a per person basis. For the solo traveler, the pricing includes what's called "single supplement". Over simplified, this is a fancy way of saying that you pay the same price as two occupants or even more. Sometimes there are lower rates during a promotion, but that is fairly rare. Obviously this makes traveling alone quite expensive and quite frankly turns many potential cruisers away, which is quite unfortunate. What about the married couple that has cruised for years and their mate is now too sick to travel or is no longer alive? Does that mean they have to now give up one of their favorite pastimes? In many cases, unless they could find someone to travel with them, that was indeed what happened. goes into dry-dock this May, and will emerge in June in time for the Alaskan cruise season. In addition to the previously announced addition of the Royal Babies and Tots Nursery, there will be three inside cabins added for solo travelers. This will be the first for the Royal Caribbean fleet. 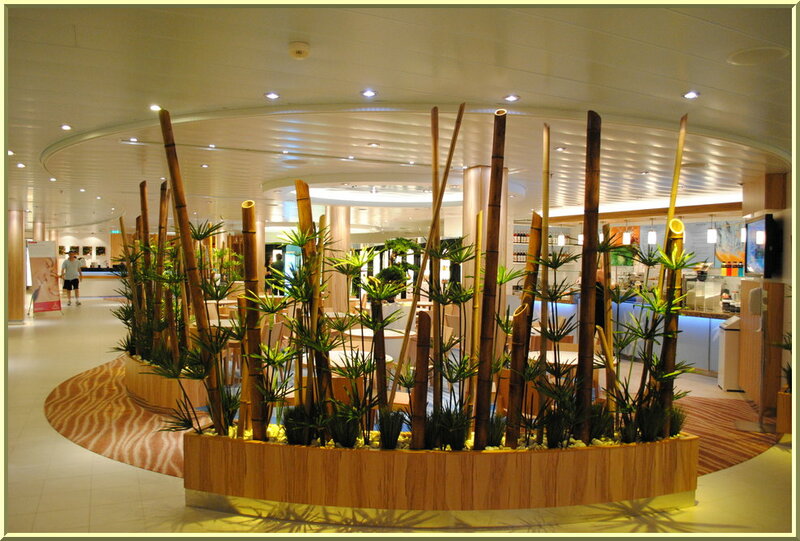 We suspect that Royal Caribbean is testing the waters to see how well the cabins are received. We see this as a positive step in accommodating a segment of the public that has been unable to purchase a cruise vacation due to the penalty pricing for solo travelers. It's only three cabins, which is dwarfed by the 100 cabin offering on Norwegian Epic, but it is a start. Norwegian Cruise line has two new ships on order which will further expand the solo studio offerings. I suspect this is only the first of many more changes for the solo travelers in months and years to come. Radiance of the Seas Sails from Seward to other adventurous Alaskan cities, including Juneau and Skagway. Which European sea is your favorite? Aegean? Black? Adriatic? Baltic? Mediterranean? Azamara Club Cruises® touches all shores of Europe in 2011, so no matter your favorite waters, a voyage beckons. With 45% of port visits in 2011 featuring overnight or late night stays (8pm or later), the 2011 Destination Guide, now available to explore electronically, is filled with itineraries in Europe, Asia and the Americas that offer plenty of time to explore the culture and experience the value that is Azamara destination immersion. While voyages around the world are available to book, European voyages booked by March 31 receive $2,000 in early booking savings as well as up to $2,000 in ChoiceAir credits on top of our 2-for-1 values. 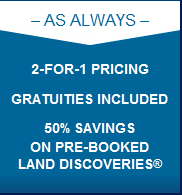 In addition, save 50% on all Land Discoveries® in Europe booked online before departure. Experience an authentic New York pizzeria onboard Allure of the Seas. Located on the Royal Promenade, Deck 5, this pizzeria is the perfect spot for lunch or even a late night snack since it is open to the wee hours of the morning. Enjoy made-to-order pizzas by the pan or slice. Select from a list of your favorite toppings to create your own personal pizza or, if you don't have time to wait, select one or more slices that are already made. While waiting for you pizza creation, put your creative juices to work some more by creating a made-to-order glass of your favorite Coca-Cola beverages. There are 106 combinations of drinks that can be made in this specially designed beverage vending machine outside Sorrento's Pizzeria. It's easy as 1-2-3 ... Start with a glass of ice, add your favorite base Coca-Cola product, and add one or more additional flavors. Enjoy combinations like Cherry Coke, Raspberry Diet Coke, or Strawberry Sprite to name a few possibilities. There's no charge to have pizza your way and if you have added the Coke beverage package, there is no additional charge for the that either. Stop by Sorrento's anytime you want to have some fun creating your snack. There's nothing like a good football game to get some excitement brewing. This Sunday, fans will be gathering together to cheer their favorite team on to victory. Where will you be? Some fans will be at the game weathering the cold winter breezes while, others will be on a cruise ship in the Caribbean, and still others will be at friends' houses or their neighborhood bar & grill. Besides football, another popular game is the Wii. Cruise ships have embraced the rage and many have added game consoles to their entertainment suite. Contests are held throughout the cruise. Norwegian Epic has taken Wii to a new level by introducing it's Wii Wall which is a two-story screen with plenty of room for cheering fans. What's this have to do with the football playoffs? In the picture above, I'm sitting at a counter in O'Sheehan's Bar and Grill on the Norwegian Epic. What you can't see is that if I turn around and face forward, I'm looking down on the big screen Wii Wall. This will be the best seat in the house to watch the NFL football playoffs, or any sports game for that matter. O'Sheehan's will be buzzing this Sunday as the teams take the field. You can enjoy the game while drinking your favorite beverage and having some comfort food. These photos (click for more) were taken by us during our National Conference on Norwegian Epic last October. There was plenty of excitement onboard as football fans gathered to watch the game. I can just imagine the increased level for the playoffs. It's cold and snowy here today, a perfect setting for the playoff game tomorrow. I can only dream about being on Norwegian Epic in the Caribbean and watching the game on the big screen. Would you like to watch the NFL Playoffs on Norwegian Epic next year? Send us an email if you are interested. If we have enough interest, we can form a group for one of the playoff games next year. Enjoy the Playoffs - may your favorite team win !!! Azamara Club Cruises® is taking destination immersion a step further with the new Azamara Club Golf Cruises in partnership with PerryGolf. These unique and exclusive packages let guests play exquisite, championship-caliber golf courses in Asia and Europe while traveling in the comfort and style of Azamara Journey® or Quest®. Let Azamara coordinate tee times, cart rentals, luxury transfers to the course, range time, golf balls, club storage and gratuities at .each course as well as plan special cocktail parties and socials for golfers. Play a round at Old Head, Portmarnock, Oitavos Dunes, Montgomerie Links, Mission Hills, Four Seasons Provence, Sperone or another world-class course knowing that Azamara’s personal touch service is taking care of you. Many of you have been checking back for updates on Carnival Splendor. As we mentioned back in mid-December, the Splendor would have some repair work done in San Diego and then sail to San Francisco to have work completed at a dry dock. That was scheduled for mid-January. Today marks a major milestone in the long journey back to service for the Splendor. It's hard to believe it's been two months since the Carnival Splendor was towed into San Diego following the engine room fire. The ship will leave the Tenth Avenue Marine Terminal today and sail under its own power to a dry-dock facility in San Francisco, where repairs will be completed. Carnival Splendor has been out of service since Nov. 8, when a fire broke out in the ship’s engine room during a cruise to the Mexican Riviera. The 952-foot vessel was left without power while offshore of Ensenada. With more than 3,000 passengers aboard, Splendor was towed by tug boats into San Diego Bay on Nov. 11, led by the U.S. Coast Guard. Passengers disembarked at the B Street Cruise Ship Terminal and the ship was then moved to the Tenth Avenue Marine Terminal on Nov. 18 for the industrial portion of the repairs. Carnival Splendor will be accompanied by two tugs as a safety precaution during its multi-day voyage north, according to Coast Guard officials. 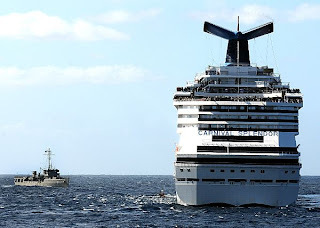 Carnival Cruise Lines is still saying that Carnival Splendor will return to service February 20, 2011. It operates year-round seven-day Mexican Riviera voyages from Long Beach. Since Carnival Splendor is one of the last ships in this market, this is very important to the West Coast economy as well as tourism in the Mexican Riviera. On Mediterranean 7-day cruises including a one day call at Tunis (Tunisia), this call has been replaced by a one day call at Palma de Mallorca (Spain) Malta or Cagliari (Italy). In case that the situation gets back to normal, the original itinerary will be respected and the call at Tunis will be operated as usual. Updates will be posted on MSC's website. Costa Magica's scheduled port of call to Tunis on Monday was cancelled and replaced with Ajaccio due to the political unrest in Tunisia. Fortunately this is low season for Europe cruises so this is the only impacted cruise ship. There were several cruises scheduled to call in Tunis over the next few weeks. Passengers will be informed of additional changes. The U.S. Department of State warns U.S. citizens about the current political and social unrest in Tunisia and recommends deferring non-essential travel to Tunisia at this time. A state of emergency was declared in Tunisia on January 14. The civil unrest has recently spread to Tunis and all major cities, including popular tourist destinations. These spontaneous and unpredictable events have degenerated on several occasions into violent clashes between police and protesters, resulting in multiple deaths, injuries, and extensive property damage. The UK Foreign and Commonwealth office advise against all but essential travel to Tunisia. A State of Emergency was declared on the afternoon of 14 January under which it is illegal for more than two people to congregate in a public place, including in cars. Parliamentary Speaker Foued Mbazaa has taken over as interim president. It was announced on 17 January that a Government of National Unity had been formed. The situation overnight (18-19January) in Tunisia was quieter but incidents of violence and looting are still possible. There were further demonstrations in a number of cities across the country yesterday and these are expected to continue today (19 January). The risk of sporadic violence and looting remains. Consult either the UK or US sites for additional information. Disney Cruise Line® is proud to welcome the Disney Dream™ to its fleet. 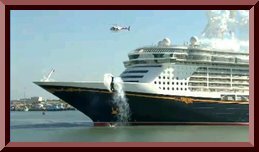 And, you can be a part of the excitement by watching a webcast of the official Disney Dream christening ceremony at 10:30 a.m. EST on Wednesday, Jan.19, 2011. 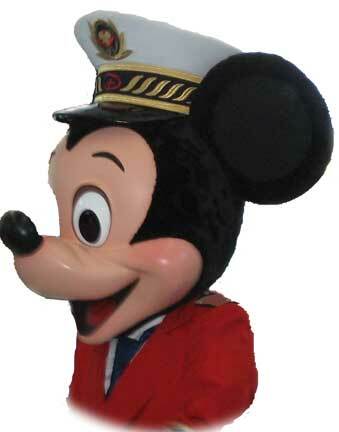 Today another dream comes true as Disney Dream™ is officially christened. It's an event you won't want to miss, filled with magic, enchantment and a few surprises along the way—including Honorary Godmother, Academy Award® winning performer, Jennifer Hudson, whose own dreams of stardom began back in 2003 when she was a performer on Disney Wonder®. 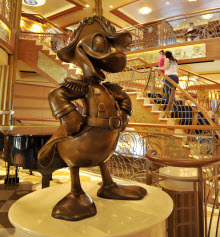 Accommodating up to 4,000 guests, the 130,000-ton Disney Dream takes Disney’s special brand of family cruising to a whole new level with industry firsts. All of the ship’s new features – combined with Disney quality entertainment, unique dining experiences and age-specific areas for children, teens and adults – create an unforgettable cruise experience for the entire family. Vanilla? Chocolate? Vanilla & Chocolate? or Banana? Orange Creamsicle? Red Velvet? Turtle? PB&J? German Chocolate? or Manly Whisky? 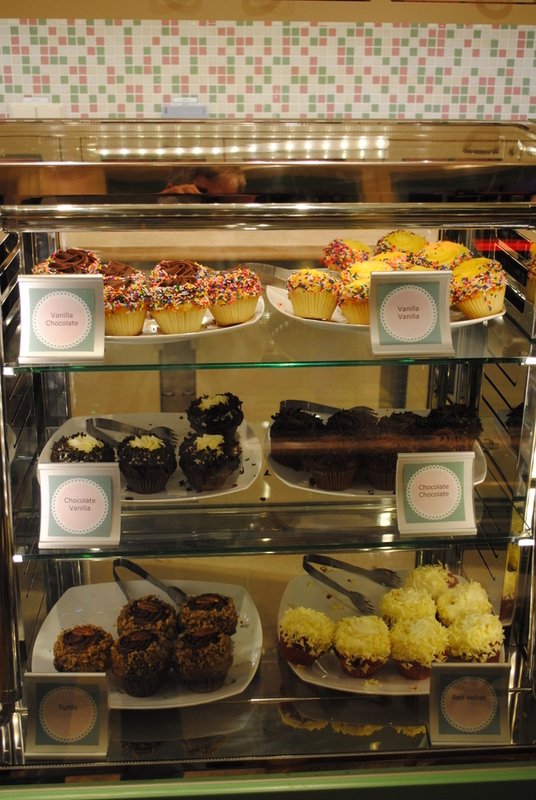 Enjoy a daily menu of freshly baked cupcakes reminiscent of Grandma's kitchen. 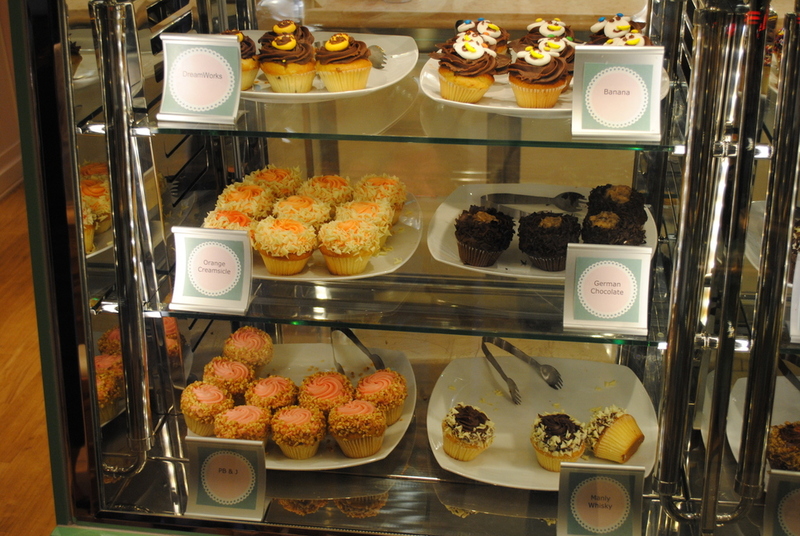 For a nominal charge, $2.50 when we were on the Allure, you can select your old favorite cupcake or try one of the daily creations. 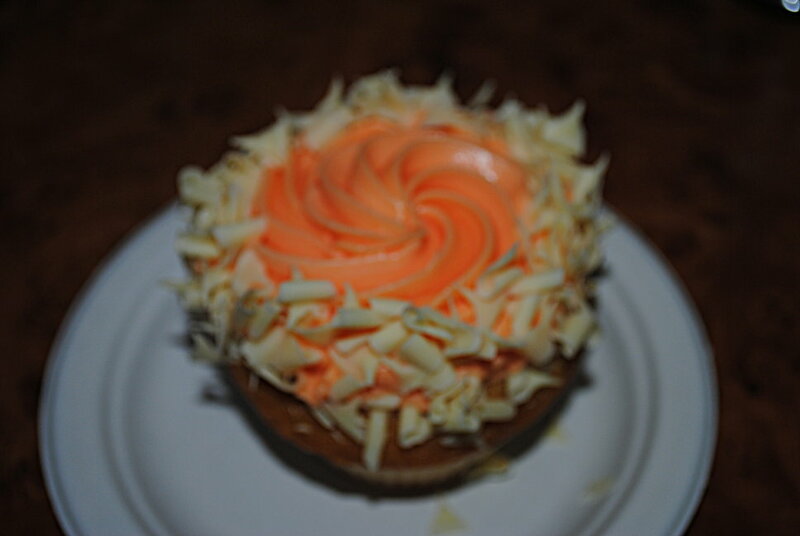 The cupcakes are very rich, so you might want to share one with someone you love. You can always go back for more - that way you can try different flavors. My husband and I split an Orange Creamsicle, pictured here. It tasted just like the frozen treats with same or similar names. The shop also is available for private cupcake decorating classes and private celebrations such as weddings and birthdays. 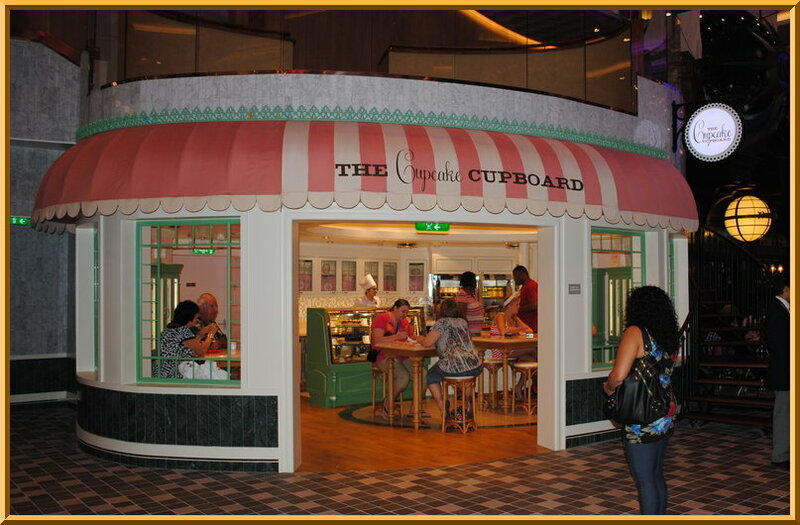 Stop by the Cupcake Cupboard on Royal Promenade, Deck 5 for something sweet to hold you over until your next meal. Indulge your taste buds with a meal that's just as good as it is good for you. This contemporary bistro offers health-conscious breakfast and lunch buffets in a casual setting. 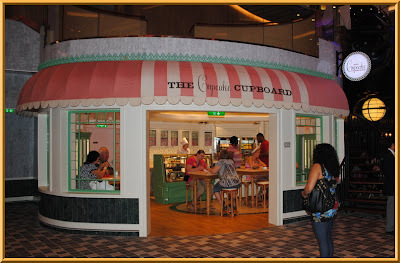 The bistro is located in the Solarium, Deck 15 on the Allure of the Seas. The lunch selections on this particular sailing day included Starch Fava Bean and Chick Peas Stew with Root Vegetables, Brown Rice, Crepes Sauteed Shrimp, Mushrooms, Baby Spinach and Roasted Garlic, Crepes Vegetarian, Roasted Onions, Garlic, Mushrooms, Wilted Spinach and Thyme. In addition to the main entrees, the bistro features a selection of Miso soups which are traditional Japanese soups consisting of a stock which has miso paste and other ingredients added to it. Varieties available on this particular day were Chicken Noodle, Baby Shrimp and Brown Rice, and Vegetarian Miso soups. The desserts included a selection of various fruits as well as Soya Panna Cotta, Lemon Cup Cake, Sugar-free Pineapple Upside Down Cake, and Fig Bars. There is a salad bar that includes various types of lettuce and healthy toppings. Even the salad dressings are of the healthy variety. 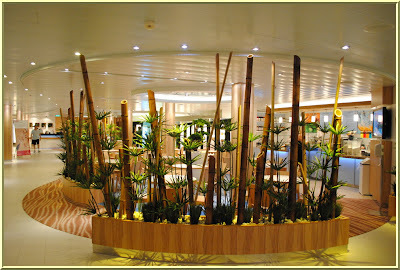 We've often said that just because you go on a cruise, you don't have to depart from you healthy eating style. The Solarium Bistro makes it easy for you to eat healthy while still enjoying a relaxing day in the sun. Just put on your cover up and stroll from the whirlpool to the bistro for breakfast or lunch. As night falls, the Solarium Bistro converts into Samba Grill, a starlit Brazilian-style dining experience, featuring specialty caipirinhas along with rotisserie-roasted meats and seafood, straight off the grill and carved table-side. There is an additional charge for the dinner. The adults-only Solarium on the Allure of the Seas gives the sensation of floating on air from the two-deck high, glass-paneled enclave designed with seating on various "islands" surrounded by water. 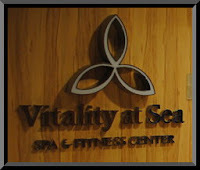 Enjoy a tranquil fresh water pool, four serene whirlpools and two cantilevered whirlpools suspended 136 feet above the ocean. The Solarium is just one of the possibilities within the Pool and Sports Zone. We'll take a closer look at the Solarium Bistro in another blog post. Does the Ship Make It's Own Power? If you have been on a few cruises I'm sure you've heard at least one Cruise Director go through his Top 10 list of Passenger Questions. This question typically makes the list. The response is usually, "No, we have a long electrical cord that stretches behind the ship all the way to Miami". Where Did You Hide The Electricity in my Cabin? Perhaps that's a more up to date question that should be on the Cruise Director's list and it deserves an answer. On most ships you'll find a limited number of electrical outlets in your cabin. There may only be one 110v and one 220v along with one special outlet in the bathroom that can only be used for your electrical razor. Often you need to hunt for the outlet which might be under a desk or behind something on a shelf. We've all heard about the two inch difference between the Allure of the Seas and the Oasis of the Seas. What you might not have heard is that the Allure learned many lessons from its little sister, Oasis. One of those lessons was that the electrical outlet needs to be visible and it needs to accommodate more than one appliance. In this day and age where every gadget comes with its own charger, and for who knows why, they all have to have different connectors, it is typical for a traveler to arrive at the hotel room or ship cabin with a bag full of chargers. With a limited number of outlets, one must "timeshare" to get all their devices charged. Allure of the Seas has a unique new design. Three outlets are in a round housing that is mounted on one side of the counter. While this is an improvement, it still offers a challenge which we've demonstrated in the included image. 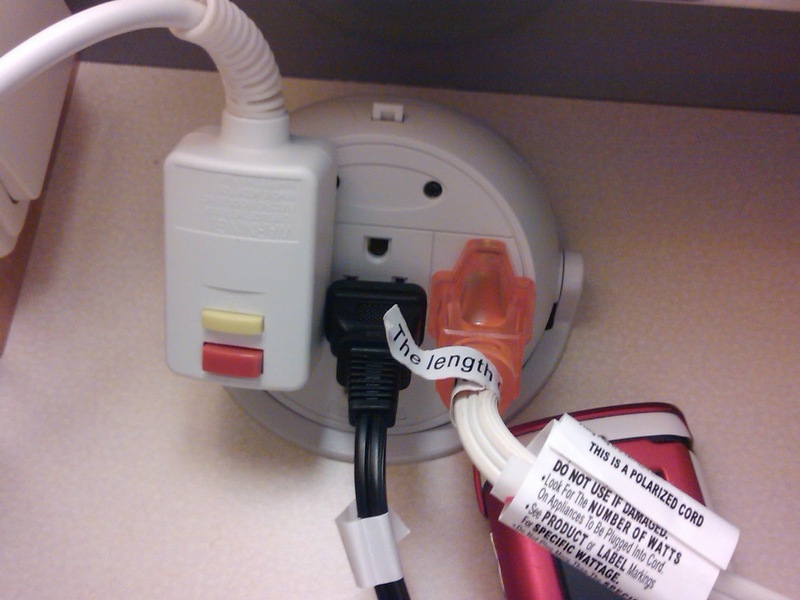 Many chargers have oversize plugs (eg. transformers) which take up more room. Unless you prepare in advance, you could be limited to one or two usable outlets. In this picture we have three devices plugged in: the hairdryer that is in the cabin, my extension cord for my PC, and my cell phone charger. The cell phone charger and the hairdryer are both devices that have over-sized plugs. We solved that problem by traveling with short extenders that have a normal plug on on end and the outlet on the other. They are about three inches long and can fit nicely in your bag of chargers. We travel with three of those typically. My set of 3 were purchased at Big Lots for $3 and they have more than paid for themselves. Another new feature that Allure of the Seas adopted from her little sister's experiences was the addition of an iPod docking station in the cabin. When its time to retire to bed for your long (or short) nap, plug in your iPod for some of your favorite tunes. The timer will turn the device off after its played for awhile if you like. If you just need to charge your iPod, dock it on the other side and you don't need any extra wires. This helps free up one of those precious plugs on the opposite end of the counter top. The final point that I want to make is each cruise line has their list of electrical devices which are not allowed on the ship. They ban devices such as irons which could cause a fire if left unattended. Fire is the worst enemy at sea so it is very important that you heed the guidelines the cruise line provides. Each cruise line has the list posted on their website in the FAQ and may also include it in the embarkation documentation. If you aren't sure about a device, leave it home. New Years is a time when resolutions are made. Common resolutions include taking better care of ourselves, eating well, and getting more exercise. Making resolutions is perhaps easy to do but we often find that keeping them, as time passes, is often much harder. For those that are still keeping their resolutions, congratulations. 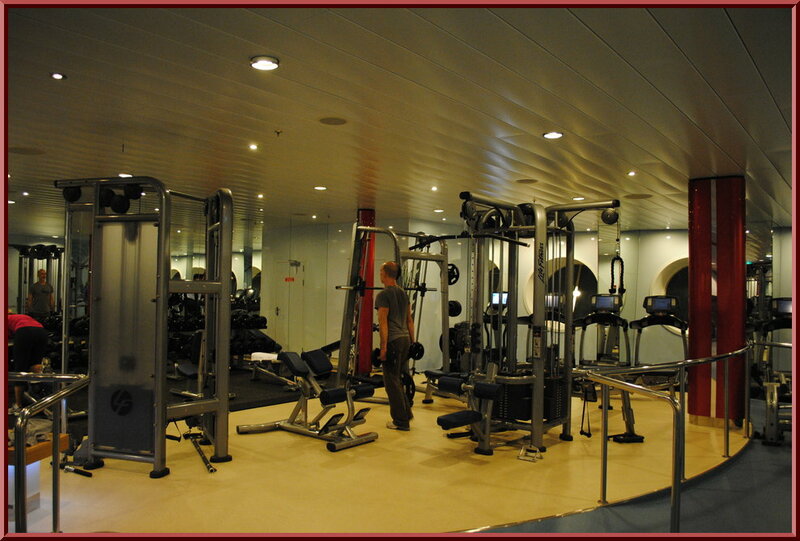 Why do I bring up fitness resolutions in a cruise blog? Going on a cruise vacation doesn't imply that you'll have to break your resolutions. While it is true that you can eat 24 hours a day if you like, that doesn't mean you have to do so or eat foods that go against your new healthy lifestyle. Quite the contrary is actually the case. 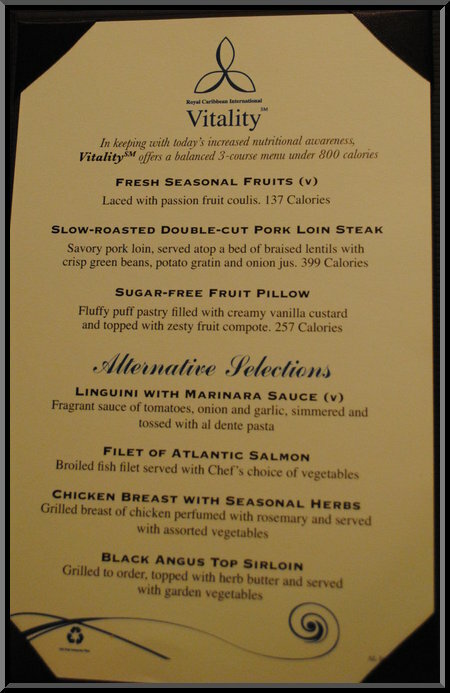 Cruise lines offer a wide variety of food for all lifestyles. Many ships have recently expanded dining options to include spa menus served in either a spa restaurant setting or in the main dining room.